You can eat fresh tomatoes and cucumbers on their own, but you can also eat them together in a salad for a snack or light side dish. A tomato and cucumber salad can be rich in essential nutrients, such as potassium and vitamin C, and some kinds of tomato and cucumber salad can also help you lose weight. To promote weight loss, also consider the remainder of your diet. 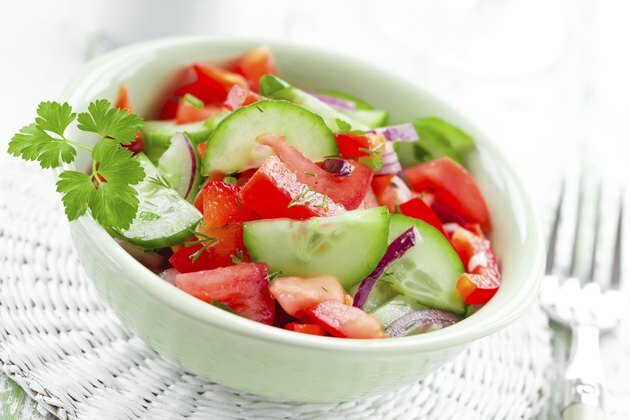 Tomato and cucumber salads can assist with weight loss by helping to satisfy hunger without adding many calories. A cup of chopped tomatoes contains only 32 calories, and a cup of raw cucumber slices has 16 calories. Herbs and spices, such as oregano, thyme or basil, can flavor your salad while adding hardly any calories. Have a serving of tomato and cucumber salad instead of coleslaw at a summer barbecue, or make a low-calorie, filling meal out of tomato, cucumber and grilled chicken salad with whole-grain bread. Protein is a filling nutrient that can delay the onset of hunger, but a tomato and cucumber salad can be low in protein. Including a source of protein with each meal and snack can help you lose weight, but a cup of chopped tomatoes provides 1.6 grams of protein, or 3 percent of the daily value for protein, and cup of cucumber slices provides less than 1 gram of protein. Increase the protein content of your tomato and cucumber salad by making a Greek-style salad with low-fat feta cheese or adding chickpeas. A high-fiber diet can help you control your weight, but the typical American gets only half of recommended amounts. A cup of chopped tomatoes provides 2.2 grams of dietary fiber, or 9 percent of the daily value based on a 2,000-calorie diet. A cup of cucumbers provides 0.5 gram of dietary fiber. Increasing your fiber consumption can help suppress hunger to help you lose weight. Have tomato and cucumber salad instead of a low-fiber snack or side dish, such as pasta salad. A tomato and cucumber salad with a large amount of high-fat dressing or oil is higher in calories and less likely to help you lose weight. You can make a fat-free, low-calorie tomato and cucumber salad with red onion, tomato, cucumber, parsley and lemon juice, or make a small amount of dressing with olive oil and balsamic vinegar for a salad that is relatively low-calorie. Top your cucumber and tomato salad with fresh dill and fat-free Greek yogurt instead of dressing it with full-fat sour cream.